Back at it, linking up with my girl Ashley for Friday's letters! Dear Friday, thank you so much for bringing yet another busy weekend my way. *side eye* I don't feel ready for two weddings and 3 crazy days at the salon after this last week. Dear brand new website, welcome to the world! I admit my first attempt at HTML5 template usage went horribly awry, and I ended up throwing things. Once I got used to the new menu options and location of things, attempt #2 turned out alright and I was able to convert my cute little Flash site to a language even iPhone users can access! Go check it out, it's pretty in pink and has four different portfolios of my hair and makeup work! Dear rest, I miss you. Maybe in a few weeks we can be reunited? Dear Billy, I've been so jealous of your time off this week! Calling you in the afternoons and finding out you were napping, or had been on the couch all day made me steam! I still love you, but man what I would have traded to be in YOUR shoes this week! Dear Ashley, I am so incredibly sad you are leaving San Jose and me next week! I know Michigan is where family is, and it's technically home, but you have become a great friend and I will miss you so much! Too bad we didn't get more pictures together, I am sure my blog readers think I am making up our friendship lol! Thanks for introducing me to Michaela and Kate, I am glad to have more new friends, even after you leave! Dear Haute Bride, thank you so much for being such an amazing local business and allowing me to borrow a beautiful Modern Trousseau gown and so many incredible jewels and accessories. The styled shoot wouldn't have been anything without your support and contributions! PS- if any of you brides are looking for amazing accessories, please check out this boutique! All of the pieces are designed by the owner Lindsie, and they are just breathtaking! OMG I love those photos!!! I am so excited to see more of this styled shoot, looks amazing!! vegas - so jealous!! found you through friday's letters and happy that I did! I am so jealous that you are not only going to Vegas, but that you have also already been there! I just want to go once. JUST ONCE! I've been seeing all Ashley's posts about the styled shoot..that's fun you were part of it too. Can't wait to see all the pictures from it. 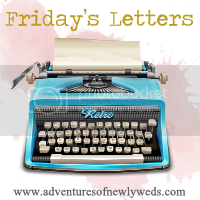 Saying "hi" from Friday's letters!